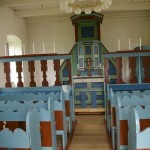 Viðey Church was con­secra­ted in 1774. It is one of Iceland´s oldest churches and still has its orig­inal inter­ior fitt­ings. The church is open to all visitors. For bookings please contact videy@reykjavik.is or phone +354-411-6360.